When in Reykjavik, we dined at Dill, an innovative restaurant showcasing New Nordic cuisine. There were many inventive and complex dishes, but a standout for us was one of the simplest – bacon butter. Served on a rock, alongside some fresh soft bread, it stole the show. Being Canadian, it’s my duty to share the flavours of bacon with others, so I made up some bacon butter for a dinner party hosted while in Ireland. It was a hit. There’s not really a ‘recipe’, and perhaps the creative folks at Dill have a few more tricks, but here is how I made bacon butter if you’re inclined to try it. You won’t regret it. 2 strips of bacon – you want meatier strips, so thick cut is better. Cut the bacon into a fine dice – really fine, like brunoise if we’re being fancy, or like the size of a matchstick head if we’re being everyday. You need the bits to be small so that they add flavor to the butter, but so that you still have a spread. You could pulse lightly in the food processor to speed up the chopping. Heat a pan to medium and add the bacon bits. Allow to cook until nice and crispy. Transfer to small bowl, including some of the bacon grease, about half a teaspoon. Allow to cool. Add the softened butter and mix with a small spatula to blend the bacon into the butter. As bacon is already salty, I have used unsalted butter. You want to add a pinch of salt and pepper to brighten the flavours, but be careful not to overdo it. 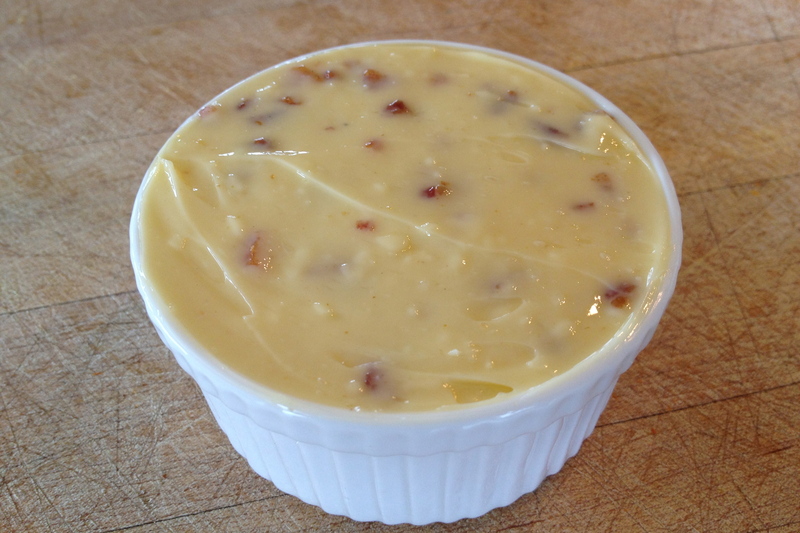 Your bacon butter mixture is likely quite soft. Not to worry. Chill the butter for a few hours to allow the flavours to combine and the texture to settle back into a more solid state. I suggest transferring to a small ramekin before chilling, and then your butter is ready to serve. You can also place the butter mixture onto a piece of saran wrap or parchment paper, wrap the butter into and then roll into a cylindrical (log) shape. Once it has solidified in the fridge, you can slice to serve. Remove from the fridge about half an hour before serving to allow the butter to soften so that it spreads easily. Serve with fresh bread, like a baguette or focaccia. Irish soda bread works well too.